Alice Wootton (Wooton) was one of Alexandria, Virginia’s forgotten community leaders. 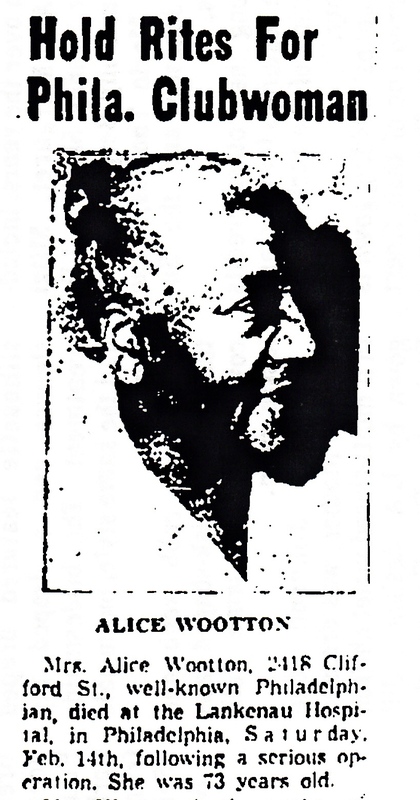 She was a dynamic civil rights leader that was instrumental in advocating for Parker-Gray School to become a high school. Mrs. Wootton was born in Culpeper, Virginia. She and her husband, Joseph A. Wootton who was a prominent religious, fraternal and labor leader, migrated to Alexandria after 1900. They lived at 610 South Asaph Street. The Woottons had four children, Joseph L, Ruth, Florence and Rose, and they adopted Bertram T. Robertson. Joseph, her husband died around 1920. Alice continued to live in Alexandria, Virginia doing community services until her children migrated to Philadelphia. The family had relatives in Philadelphia. In 1927, Mrs. Wootton migrated to Philadelphia and continued her community services in civic organizations there. She became very active in her church, Mt. Olive Holy Church in Philadelphia. On February 14, 1953, Mrs. Alice Wootton died from complications of surgery at the age of 73. She was buried in a family plot at Mt. Lawn Cemetery, Darby, Philadelphia, Pennsylvania. Alexandria’s African American history is made richer by the contributions of Mrs. Alice Wootton. This entry was posted in Black People of Alexandria, Migration and tagged Alice Wooton, civic organizer, Culpeper Virginia, Migrated to Philadelphia, Mt. Olive Holy Church. Bookmark the permalink.